Finally, a recipe I could make well. My previous attempts, though so very tasty, turned out rather 'wet', so we had it almost frozen, and it was just as great. But this one's a keeper. This recipe is scaled to fit my dessert-loving family of 7. Perfect in an 8x13 pyrex dish. Chocolate curls to garnish, if so inclined. 1. Stir together the coffee, brandy and brown sugar and set aside. 2. In a double boiler, or in a VitaMix, beat together the egg yolks, sugar and cream until the mixture lightens in colour. About 2 minutes. 3. Add the mascarpone and brandy into the mixture. 4. Dip half the ladyfingers in the coffee, and lay them in the pyrex dish in a single layer. 5. Spread half the mascarpone mixture on top. 6. 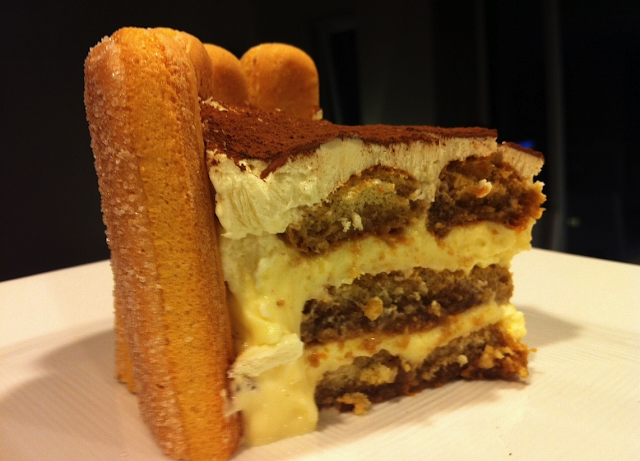 Repeat with the other half of the ladyfingers, and the remaining mascarpone. 7. For best results, refrigerate to set for an hour. 8. Beat the remaining 1-1/2 cup cream and sugar until stiff peaks form. 9. Spread this on top of the chilled tiramisu. 10. Using a small strainer, dust the whipped cream with the cocoa. 11. Top with chocolate curls.